The IR HUNTER MK II's design comes from decades of rifle shooting experience. 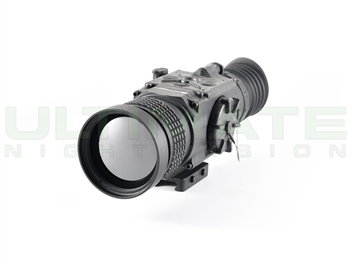 The MK II is the first and only 12 micron, 60hz, day/night thermal weapon sight system on the market. The MK II is available in 640 resolution with 2 lens options. The 12 micron core means existing lenses have a 35% increase in magnification over 17 micron sensors. The 12 micron sensor also allows a lighter weight and lower cost system over 17 micron sensors. With a 3 turret control system to operate every function, the IR Hunter MK II is an easy system to master for hunters of all skill levels and experience. With a design similar to standard day optics, all the shooter needs to think about is sight alignment, cheek-weld, breath control, trigger squeeze, and not about pressing the wrong button. 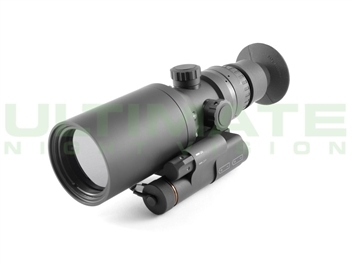 The IR Hunter MK II by IR defense is a revolutionary thermal scopes that uses a 12 MIcron BAE Micro core and a menu level system in conjunction with turrets to make operation intuitive and fast. The IR Hunter can be set to 30hz or 60hz, has a built in auto-dimmer, image capture, edge detect mode and more. The BAE 12 micron imagery is truly amazing and produces some of the most crisp thermal images every seen on the commercial market. The MK II also has dynamic reticles so they keep proper ballistic calculations on every zoom level. There's even a subtension reticle for ranging. 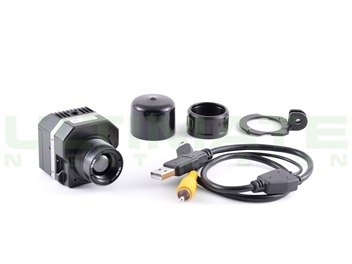 If you are interested in recording thermal video for your IR Hunter we have ruggedized custom made video cables designed just for the MK II. We offer IR Hunter rentals to try before you buy and have a variety of IR Hunter MK II videos for pre-purchase evaluation. There are certain tactical situations that require your display to me very dim so as not to be detected, and to reduce night blindness after coming off of your eye piece. 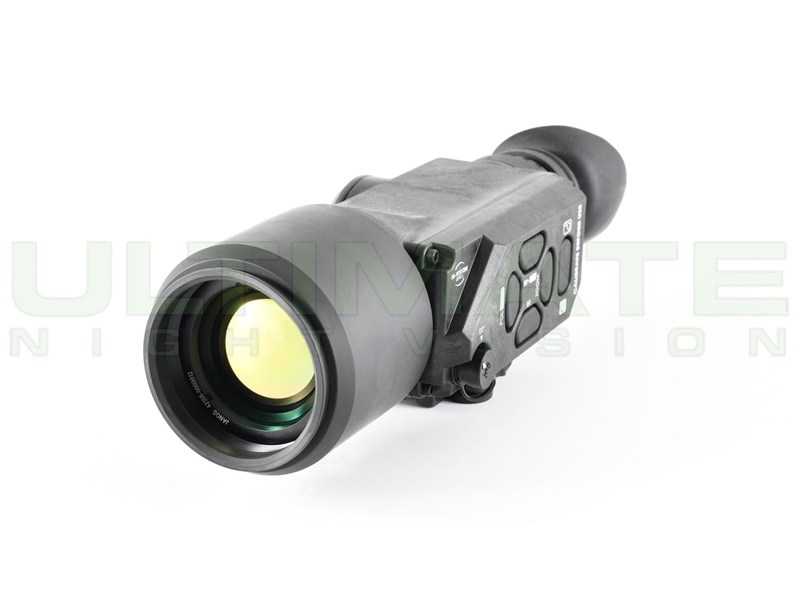 The IR Hunter MK II has an advanced feature that has been used on certain high end military thermal sights for years. Edge Detect gives you an entirely different way to view your target, with 90% of the screen black, and only the edges surrounding your target white. 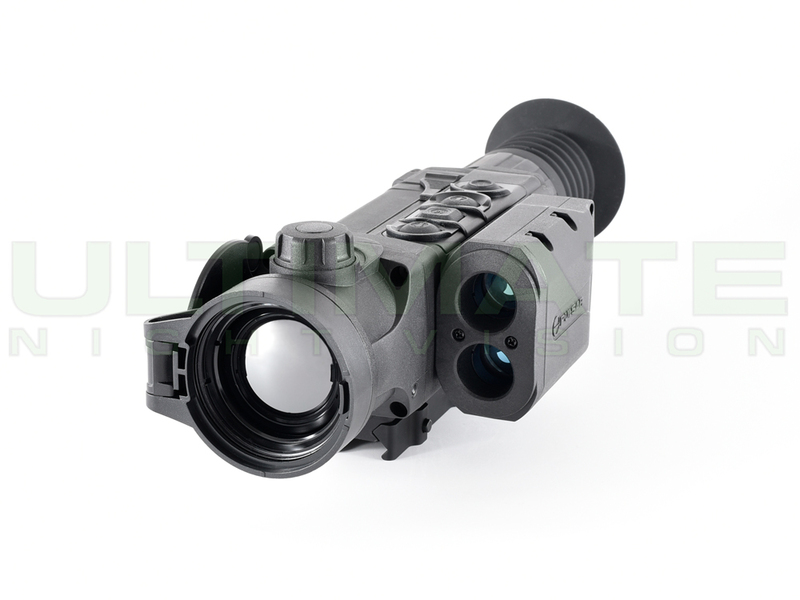 This is an extremely useful feature and is not found on any other commercially available thermal weapon sights. Since the launch of the IR Hunter we here at UNV have seen IR Defense deliver every scope with a high level of quality control and customer service. We not only sell the IR Hunter MK II, we use the IR Hunter MK II on a frequent basis educating customers and night hunting. 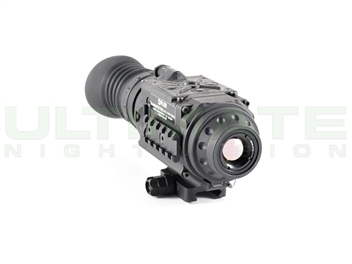 The IR Hunter line of thermal weapon sights are designed and built by an American company comprised of industry experts, shooting enthusiasts, and technicians obsessed with high quality thermal imagery. 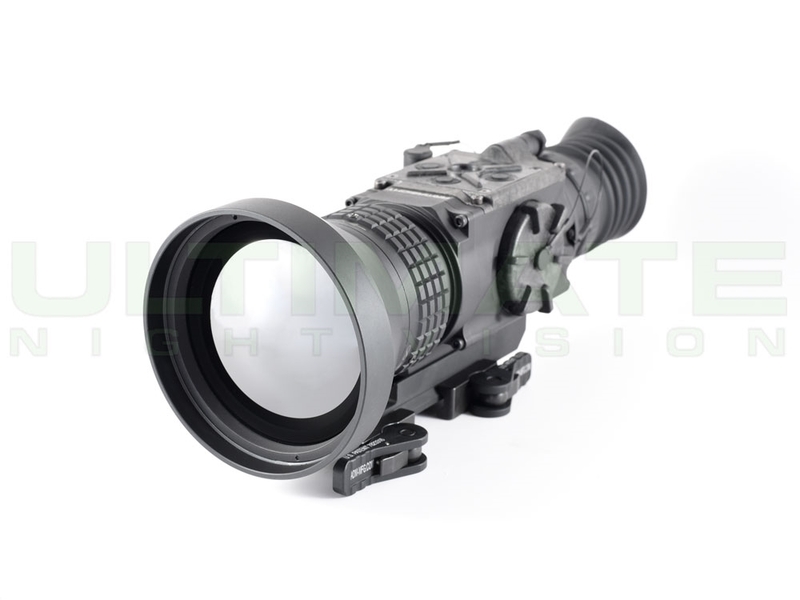 The MK II is the first and only 12 micron, 60hz, day/night thermal weapon sight system on the market. The MK II is available in 640 resolution with 2 lens options. The 12 micron core means existing lenses have a 35% increase in magnification over 17 micron sensors. The 12 micron sensor also allows a lighter weight and lower cost system over the IR Hunter standard. With a 3 turret control system to operate every function, the IR Hunter MK II is an easy system to master for hunters of all skill levels and experience. With a design similar to standard day optics, all the shooter needs to think about is sight alignment, cheek-weld, breath control, trigger squeeze, and not about pressing the wrong button. The IR Hunter MK II has been designed and built by a team that has been delivering great thermal sights, industry-wide, for 20 years. Not just technicians, the IR Hunter MK II designers are enthusiastic, American Shooters as well. We passionately demand reliability and precision from our optics when putting rounds down range no matter the weather conditions, nor the time of day. 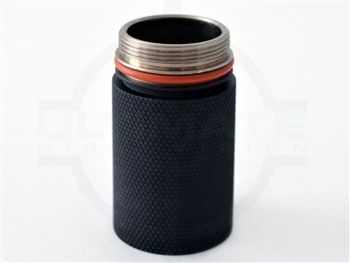 This drive and commitment lead us to make the best possible thermal scope,and, we did it! It was achieved,1 00% here in the USA, and without compromising quality or reliability. 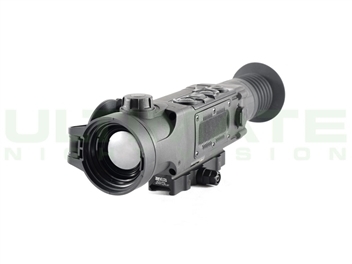 That would typically be enough; but the team went a step further, introducing the IR Hunter MK II thermal weapon sight to market for a highly competitive price. IR Hunter MK II contains all the features and ergonomics you have wanted, combined into a sleek system made to securely fit onto your rifle. You should find comfort operating the IR Hunter's Turret Knob controls as they are located where you expect them to be, same as your day optics. The other guys' button controls are nice; but in the dark, downrange, under fire, your natural instincts will appreciate the IR Hunter's similarity to your day sight. We have also incorporated an advanced lens and EZ calibration system to reduce operate error and increase successful shooting. One of the key attributes of the IR HUNTER is processing power which gives you a BIG and CLEAR IMAGE with super sharp detailed symbols and reticles. This combined with our high precision adjusters allows you to simply sight in, and quickly make ballistic corrections the shot demands. More precision, more hits! Average Rating: 5 of 5 Total Reviews: 8 Write a review. All I can say is wow! Amazing detail, easy to use and Richard was a fount of information. Will definitely do business with Ultimate Night Vision again. I cannot say enough good things about Tyler! He was able to provide profound information about all the products and was able to answer all of my questions and resolved my concerns. Tyler did not waste anytime shipping out the scope. 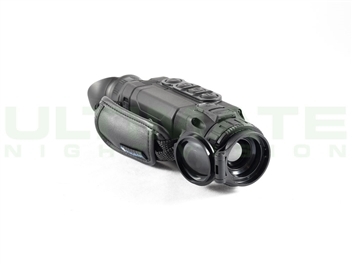 I recommend ultimate night vision to anybody! Great product!! Everything I hope it would be. I could not be happier with how the process was handled, from the initial pre-order to delivery, all comms have been thorough & prompt. 10/10 Thanks Tyler!